We accept many dental plans, such as Met-Life and some Delta Dental plans. Additionally, we are an in-network provider on nearly all PPO or DPO plans. We don't accept most Dental HMO plans. Tip: Did you know that by using an in-network PPO or DPO dentist, your co-pay may be lower? 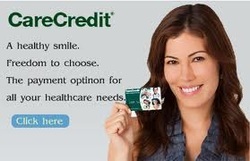 At Harbor Dental, we offer CareCredit for our patients looking for no-interest monthly repayment plans. You can apply online on their site, www.carecredit.com.